Also known as the Hissing cockroach or simply “Hisser,” the Madagascar Hissing cockroach is one of the largest cockroach species; growing up to four inches in length. Much different from other cockroach species, Madagascar Hissing cockroaches possess horns, are wingless and are excellent climbers. The Madagascar Hissing cockroach will hiss, when disturbed or alarmed. 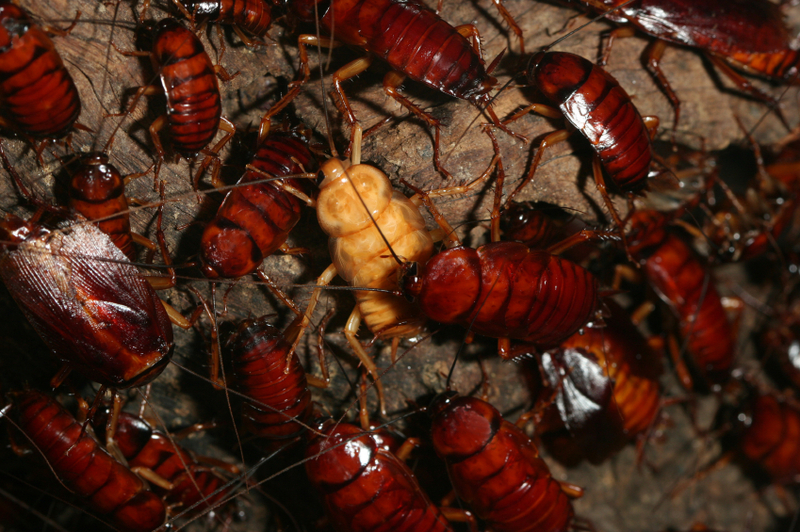 These cockroaches produce this sound, by expelling air though slits in the abdomen. The hiss of the Madagascar hissing cockroach, has been described as very loud and plays an important role in the cockroach’s colony hierarchy, courtship and communication. Because they cannot fly, they are not aggressive and they do not bite, Madagascar Hissing cockroaches are occasionally kept as pets. In the United States however, insect and bug control professionals warn that some regions (like Florida for example) require permits, before this cockroach species can be kept privately; or bred in colonies.